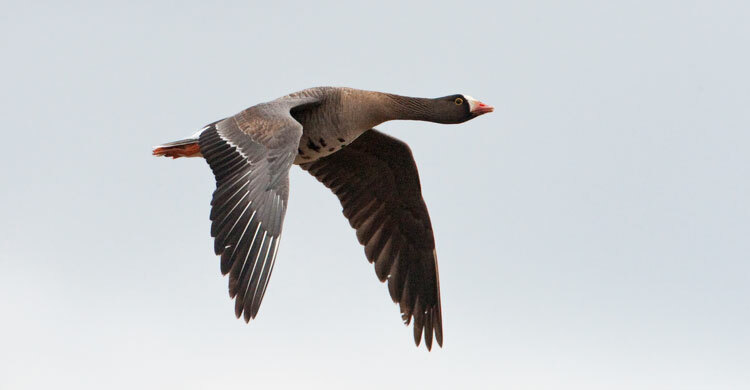 Bonn, 20 December 2017 – As the year draws to an end, the opportunity presents itself to provide an overview on Lesser White-fronted Goose conservation activities and projects that have been implemented under the framework of the AEWA Lesser White-fronted Goose International Working Group in 2017. The year has certainly been a very busy one for the Working Group, as showcased below. Following the 3rd Working Group meeting in Trondheim in April 2016, the focus has been on the implementation of key conservation activities outlined in the 2016-2019 workplan. How are the birds doing? The majority of the Fennoscandian birds have arrived safely at the wintering grounds in Greece and are currently enjoying the hospitality of the Lake Kerkini Management Authority. Following a very tough breeding season for most Arctic species with deep snow on the ground well into summer, only one clutch was confirmed at the autumn staging site in northern Norway. Despite most of the birds migrating via the more dangerous eastern route following the poor breeding success, 103 individuals have been recorded in Greece to date. The large-scale monitoring expedition in northern Kazakhstan in autumn 2016 estimated the Western main population at 28,500 – 40,100 individuals, which is significantly larger than the previous estimate of 8,000 – 13,000 birds. The survey was designed to fully cover the whole autumn staging population, and was expected to register more birds than in previous surveys. Despite the high numbers recorded, it should be noted that this still probably only constitutes some 4,500-5,000 breeding pairs. The full expedition report including updated monitoring guidance is available on the AEWA website, and the core results are expected to be published in 2018 following peer-review. Follow-up expeditions will be needed in years to come to further solidify the population estimate. The question remains as to where the key wintering sites of the population are, and this has been the focus of many of the activities during the 2017-2018 winter season. The more we learn about the status of the species, the stronger the recognition that illegal killing remains a key threat – particularly along the flyway of the Western main population. An additional focus continues to be on the establishment of a network of adequately protected critical sites with appropriate management measures in place. There is also an increasing need to better understand the effects of climate change on key flood land habitats as well as on migratory patterns, as well as how such effects may be mitigated. Following the development of an Action Framework for the Lesser White-fronted Goose Eastern main population at the April 2016 Trondheim meeting with representatives from China, Japan and Russia, the development of a fully-fledged Action Plan for the flyway was considered during the 9th Meeting of the Partners to the East-Asian Australasian Flyway Partnership in January 2017 in Singapore. A decision was taken to form an expert group to consider developing an Action Plan in future, when sufficient resources for such a process have been secured. Research activities continue throughout the flyway of the Eastern main population, but the development of an Action Plan would be a crucial step in establishing an agreed international conservation framework and mandate for action for the species in this region. The AEWA Lesser White-fronted Goose International Working Group remains at the disposal of the countries along the flyway of Eastern main population, should they require any support in future. June 2017 marked the end of the 6-year EU LIFE+ project “Safeguarding the Lesser White-fronted Goose along its European Flyways” (LIFE10 NAT/GR/000638) which was headed by the Hellenic Ornithological Society and was implemented by various partners in Greece, Hungary, Bulgaria, Finland and beyond. The main focus of activities lay in tackling the threat of illegal killing by undertaking various measures, such as the establishment of a smart patrol system in Greece, to increase the safety at key sites. In addition, the project included various actions on habitat management as well as on strengthening the international network under the auspices of the AEWA Lesser White-fronted Goose International Working Group. National Action Plans for the species were adopted in Hungary as well as very recently in Greece - a crucial step in ensuring the long-term implementation of national conservation activities. During the lifetime of the project, the Fennoscandian population increased from 75 to 144 individuals and the international monitoring network was significantly enlarged throughout the Western Palearctic. All project outputs, conclusions and recommendations for future action are gathered in a special scientific report as well as in a layman’s report. Additional information is also available on the project website as well as the project’s Facebook page. The project leaves both the Range States of the Fennoscandian population as well as the wider Lesser White-fronted Goose network with an excellent basis on which to build future joint activities. The Goose, Swan and Duck Study Group of Northern Eurasia (RGG) implemented monitoring and conservation activities at key sites for the Lesser White-fronted Goose in the Ob River Valley and adjacent areas in the Yamalo-Nenets Autonomous Okrug in northern Russia during August and September 2017. The cold spring and summer in the breeding grounds led to low breeding success for Lesser White-fronted Geese also in the Russian Arctic, with very few broods observed. The project re-confirmed the importance of the eastern parts of the Yamalo-Nenets Autonomous Okrug as a staging area for Lesser White-fronted Geese prior to autumn migration. A total of 5,190 individuals were counted in the area during direct aerial surveys in September 2017 (in the Ob River Valley and in Baydaratskaya Bay). The final project report will be available in the beginning of 2018 as part of the AEWA Lesser White-fronted Goose International Working Group report series. Although illegal killing of Lesser White-fronted Geese remains the main threat to the species - particularly along the eastern migration route through Russia and Kazakhstan down to wintering areas in Azerbaijan, Iran and Iraq - the motives behind illegal killing of the species are often unknown. By understanding the exact drivers at the individual sites, we will be in a better position to implement appropriate conservation responses. As such, Stirling University, in cooperation with the Association for the Conservation of Biodiversity in Kazakhstan (ACBK), undertook an assessment of the motivations for hunting geese (including the illegal killing/accidental shooting of Lesser White-fronted Geese) in the local communities adjacent to key staging sites during the autumn of 2017 in Kazakhstan. The assessment found strong evidence suggesting that there is a significant lack of knowledge regarding whether Lesser White-fronted Geese are protected or not, including respondents that owned goose hunting licences. Given that there are an estimated 10,000 hunters in north-western Kazakhstan, the study therefore estimated that over 1,000 hunters, with goose hunting licences, may unknowingly be hunting the species illegally through lack of knowledge of the species protection. This would indicate that any conservation efforts in the region should include a strong awareness-raising component. This study will also be made available as part of the AEWA Lesser White-fronted Goose International Working Group report series in early 2018. On the heels of two very successful expeditions to locate potential wintering sites of the Lesser White-fronted Goose Western main population in 2015, the Iranian Department of Environment and the Tarlan Ornithological Society teamed up with members of the WWF Finland Lesser White-fronted Goose National Working Group as well as the Norwegian Ornithological Society for a ten-day expedition to survey areas in north-western Iran. The expedition team hit the jackpot once again at the Aras Water Reservoir on the border between Iran and Azerbaijan with a record total of 7,612 individuals counted on 8 December 2017. This is the highest winter count of this population in recent decades. It further highlights the extreme importance of the Aras Reservoir as a wintering site for the species and the urgent need for the site to be fully protected as the site represents one of the largest natural flood land habitats for the species. Unfortunately, no Lesser White-fronted Geese were found at the other sites surveyed in the area in and around Urmia Lake. A two-day regional workshop was hosted by the National Institute of Deserts, Flora and Fauna of the State Committee of Turkmenistan on Environmental Protection and Land Resources, in Ashgabat, Turkmenistan on 14-15 December 2017. Organized by Wetlands International and the UNEP/AEWA Secretariat, the workshop was attended by participants from Kazakhstan, Kirgistan, Turkmenistan and Uzbekistan as well as Finland and Norway. Discussions focused on the current status of migratory waterbird monitoring in the region, challenges each country is facing, gaps in knowledge as well as how monitoring capacity can be increased under the frameworks of AEWA and the Ramsar Regional Initiative for Central Asia, in particular. The Central Asian region is very important for many globally threatened migratory waterbirds listed under AEWA, such as the Sociable Lapwing, Red-breasted Goose, Black-tailed Godwit, Ferruginous Duck, White-headed Duck, Dalmatian Pelican – and of course, the Lesser White-fronted Goose. Unfortunately, estimates of population trends within the AEWA region indicate that most migratory waterbird populations in Central Asia are declining. Issues such as unsustainable harvest and critical data gaps which constitute the main challenges for the Lesser White-fronted Goose, are also affecting most other species in the region. Increased monitoring capacity in the region is expected to directly benefit the conservation and closing of key knowledge gaps for the Lesser White-fronted Goose – particularly in relation to identifying further key wintering sites of the Western main population. The Ashgabat monitoring workshop will be followed by a small-scale expedition carried out by national experts from Turkmenistan together with the Norwegian Ornithological Society and the WWF Finland National Working Group during 16-21 December 2017. The team will survey potential Lesser White-fronted Goose wintering sites in north-eastern Turkmenistan on the border to Uzbekistan, where a satellite-tagged bird was recently recorded. Any observations of the species will be reported on piskulka.net. The UNEP/AEWA Secretariat continued to contribute to the implementation of the Arctic Migratory Bird Initiative (AMBI) established under the Arctic Council’s Biodiversity Working Group CAFF. A mid-term evaluation of AMBI was carried out in 2017 – also with respect to the Lesser White-fronted Goose activities. The mid-term evaluation including updated recommendations for action is available on the CAFF website. Further good news included the approval of a new EU LIFE project for the Red-breasted Goose in autumn 2017, which will focus on illegal killing along the flyway amongst other activities. The project is coordinated by the Bulgarian Society for the Protection of Birds (BSPB), and presents numerous opportunities for cooperation on issues of common concern for Red-breasted and Lesser White-fronted Geese. The search for unknown wintering sites of the Western main Lesser White-fronted Goose population will continue directly after the holiday season with a three-week expedition in January 2018 to potential key sites for Lesser White-fronted Geese in Uzbekistan. The survey will be carried out by the Uzbekistan Society for the Protection of Birds (UzSPB) together with members of the WWF Finland Lesser White-fronted Goose National Working Group, and will focus on sites with previous records of Lesser White-fronted Goose sightings as well as the Talimardzhan Reservoir and adjacent areas along the border with Turkmenistan, where a satellite-tagged individual was recently recorded. These activities were made possible with the steadfast support provided by the Governments of Norway, Finland and Germany as well as the EU Commission. In addition, heartfelt thanks go to our fantastic and ever-growing Lesser White-fronted Goose network of government representatives, members of the international conservation and hunting communities, species experts, National Working Groups, conservation practitioners and many more who dedicate their time and resources to make this work possible. For more information, please contact the AEWA Lesser White-fronted Goose International Working Group Coordinator Nina Mikander.